This is the one dish of ‘greens’ that my husband will eat with enthusiasm. I have used broccolini, asparagus and sugar snap peas. Pan roasting the vegetables, toasting almonds and a generous dose of lemon gives this side a huge flavour it. Once you’ve made your greens this way, you won’t want to make another batch of token steamed greens again! Don’t underestimate the power of the lemon in this recipe. If you don’t have access to fresh lemons you can use a couple of tablespoons of lemon juice from the shelf-stable bottles (found in the spice aisle in the supermarket). The lemon-infused olive oil just adds some more depth to the lemon flavour so it is optional. Replace it with an extra virgin olive oil if you don’t have any. If you’re feeding a crowd, double the recipe. All that broccolini and asparagus will get expensive, though. So instead of doubling those ingredients, you could add a loaded handful of frozen whole green beans or use regular broccoli instead of broccolini. 1. Bring a large saucepan of water to the boil and place a steamer basket on top. 2. 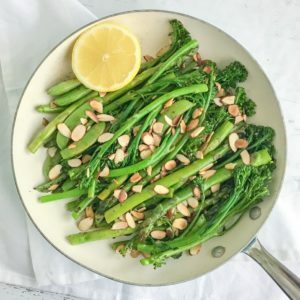 Steam the broccolini and asparagus for 1 minute. You can also boil them in the water if you didn’t have a steamer basket. 3. While the vegetables cook, heat a large non-stick frying pan over medium heat. Add in the sliced almonds and cook, tossing frequently until lightly browned. Remove from the pan and set aside. 4. Return the pan to a high heat and add the olive oil. 5. Once the oil is heated, add the partially cooked vegetables and cook, tossing frequently until visibly blistering and just tender. Squeeze over the lemon juice, season with salt and pepper and toss once more. 6. Transfer the pan-roasted greens to a platter and sprinkle over the almonds right before serving. You can also refrigerate the pan-roasted greens and serve them as a cold salad style side-dish. Add the almonds at the last minute to avoid them going soggy. I hope you enjoy my favourite way of serving green vegetables! 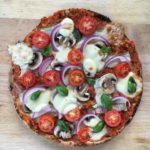 Sarah Moore is a mum, and university qualified Registered Nutritionist with a decade of experience working with families to improve their health and well-being. 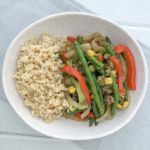 Sarah has a simplistic and practical approach to family nutrition and offer private consultations and group information sessions in Perth, Western Australia. You can find her on Facebook and Instagram for more healthy tips and tricks. I think it would work really well with Brussels sprouts. Halve them before steaming or finely shred them, skip the steaming and put them straight into the frying pan.